The second Sunday of May will always be a perfect day to honor every mother being in this world. We always know that mothers are the people who would do anything for her children and her family. That’s why mothers deserve to be honored and treated in a special way—especially on the Mother’s Day. With a personal note, the beautiful bouquet will be more meaningful. Every florist usually has greeting cards that can be used by their customer as well. Make sure it includes the bouquet and write your special messages on the card. There is a wide selection of cards to choose from, though—whether, from the florist, other sources, or you make it by yourself. Flowers might express your feeling beautifully, but the existence of greeting card will make it clearer for your mom to understand what you mean. If you know that she loves flowers and she has some particular flowers as her favorite, you can pick the flowers as a gift. This way, she will feel that you know her really well because you pay attention to her. Moreover, a bouquet of her favorite flowers is nearly impossible to resist. Let’s see whether you have other gifts or objects you would like to give to your mom on this special day. If you do, you can include the gift on the flower bouquet or flower basket as well. The best thing about flower gift is that you are able to use a flower delivery service. 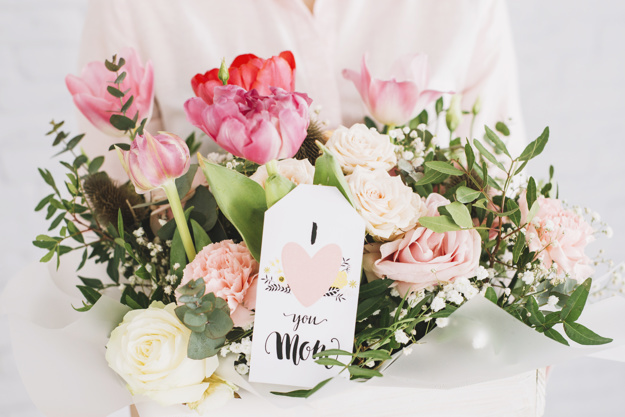 There are so many online florists available and you can use one of them to buy and make a surprise Mother’s Day flower delivery to your mother. Nothing is sweeter and more beautiful than a surprise gift of beautiful blooms on a special day, right? All you need to make your mother happy and feel special on Mother’s Day is simply by putting some thoughtful considerations for the gift. Make sure your mother feels happy is what Mother’s Day is all about, after all.